The production figures for the 2014 harvest in the UK have just been released and reveal a significant growth in volume, breaking all industry production records. 47,433 hectolitres were produced last year – the equivalent of 6.3 million bottles (75cl). This represents an increase of 42% in volume over 2013 – itself a record-breaking figure of 4.45m bottles. The figures are compiled by the Wine Standards Branch (Food Standards Agency) from records submitted by all producers post-harvest. Whilst there is currently no official detailed breakdown of styles produced, English Wine Producers (EWP) and United Kingdom Vineyards Association (UKVA) estimate that at least two-thirds of production is now sparkling wine, pointing to a production level of some 4m bottles of sparkling wine from the 2014 harvest. 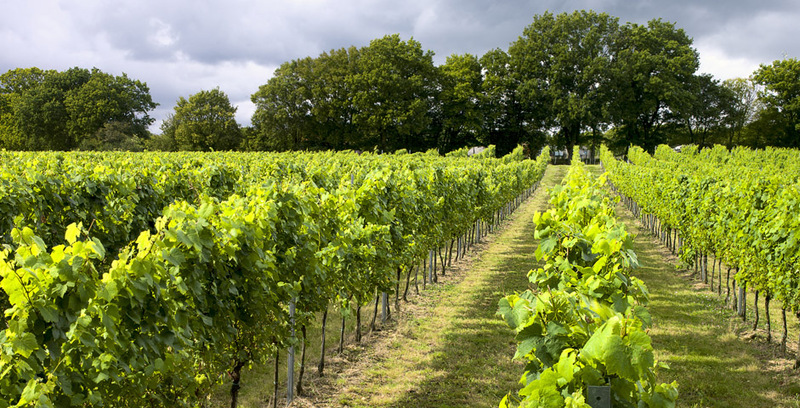 The UK Vineyard area has doubled in seven years and now stands at in excess of 2000ha (4,900 acres), the majority of which is mostly planted for the production of sparkling wine. Chardonnay and Pinot Noir are now the most popular varieties, with plantings of these two alone increasing by over 230% in the last 8 years. Production of sparkling wines has increased by nearly 150% in the last 5 years and more volumes are now coming on to the market, from established producers to new English wine brands. Still wine production also continues to thrive and 2013 and 2014 vintage white, rosé and red wines are prominently available. Bacchus is the most popular aromatic grape variety in the UK and has been enjoying a steady growth in plantings. It is the third most widely planted grape variety. Both still and sparkling wines are securing more shelf space on the high street, from multiples to independents; Marks & Spencer have just added significantly to their range of wines, introducing vineyards from across the UK, and Waitrose continue to increase their share of the English & Welsh wine market – now listing over 100 English and Welsh wines and recently reporting a 177% increase in sales of English wines over the same period a year ago. Own label English wines now also feature on several retailers’ lists.